Meet the people who make Northern campgrounds funnier, friendlier, and just a bit weirder. It’s summer and you’re roadtripping through the NWT. Maybe you want to pitch your tent off the side of the highway, far from running water or pre-chopped firewood. But here’s our advice: for at least one night, embrace the beaten track, head to one of the territorial campgrounds, and meet the park’s caretakers. It’s like showing up at your grandparents’ doorstep after a long absence: there’ll be tea and coffee, pie, and as many stories as you can handle. 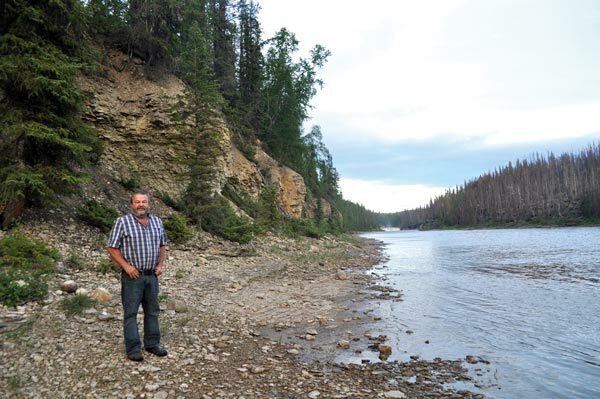 They eagerly greet every vehicle that pulls into Louise Falls day-use and campground off the side of the Mackenzie Highway, around 35 kilometres north of the Alberta/NWT border, as though they’re hosting a family reunion at their summer cottage. If you’re spending the night, Brenda signs you in, then Robert leads you directly to your campsite, with all the attentiveness of a five-star hotel concierge plus a few uncle-jokes. But many visitors continue past the log cabin the couple calls home for the summer and on down the gravel path, past the turnoff to the campsites, to the day-use lot beside the playground. From there, it’s a short stroll down a wooden boardwalk to catch a view of what gives Twin Falls Territorial Park its name. Louise Falls is perhaps the most beautiful, though smaller, of the two local attractions: its caramel-coloured water spills down tiers of limestone, shaped like a gigantic wedding cake. Then it’s a longer hike, past a lagoon, a beaver dam, and a prolific fishing hole to reach Alexandra Falls. For many travellers—too many, in the caretaker couple’s opinion—it’s a place to pass through for some photos and a picnic before heading back to the highway. Brenda and Robert want to change that. With a full-time renovations business in nearby Hay River, they’re one season into their three-year contract with NWT Parks. Their first goal, they say, is to get the grass around the campsites looking a little greener, a little more inviting. Brenda is the landscaper, literally burning rubber on her lawnmower. She also takes care of the finances. “Whaddayou have to say, ‘Just a little bit’?” Robert cuts in with his pronounced Acadian accent. Their hospitality has converted many day-use visitors into overnighters. One tourist from Japan spent a night at the falls earlier this summer and left the next day for Yellowknife. He said he got lost too many times, turned around and went straight back to Twin Falls Gorge. He was five bucks short to stay another night, so Brenda said she’d pay the difference. He repaid her with 1,000 yen, and the bill is now pinned proudly to a bulletin board behind their front desk. They plan to raze all the trees within six feet of the falls so they can be appreciated from even farther away, while gaining a stronger breeze to keep bugs at bay. Robert has built flower boxes with polar bears engraved on the sides at the campground entrance. Around the campsites, Brenda has planted petunias, daisies, ferns, and of course more grass. And then there’s the pie they’ll serve at Campers Social Nights, held a couple times per summer: Brenda’s in charge of the crust, and Robert the strawberry-rhubarb filling. They’ll share stories with their guests around campfires, and hope to hear some in return. Where do they see the park in three years? “On the map,” begins Brenda. She looks over at Robert. “As a destination,” he echoes. The first time I met Bruce Davidson was Labour Day weekend in 2013, when I stayed at Prelude Lake Territorial Park with the arts editor of the local newspaper, to help photograph Montreal pianist Roman Zavada. The artist had achieved the impressive feat of lugging an upright piano to one of the park’s walk-in campsites on the rocks overlooking the lake to fulfill his dream of composing music under the Northern Lights. Okay, so he didn’t place me right away, but said I “radiate familiarity,” and that he had a feeling we were friends—or maybe I projected the same aura of a couple of his friends, or probably both. Back in the early days, he lived in the small predecessor to the current gatehouse, which was full of “rustic appeal,” and his only entertainment came from CBC radio, a guitar and eventually a Walkman, which he mostly used to listen to waltz music. With no human company, he’d pick up a rake as a dance partner every now and again. One day, a call came in from the territorial government, checking up on him. “Bruce, how’re you doing out there?” the voice asked. “We hear you’ve been sitting in front of your gatehouse with your guitar with, uhh, very little clothes on. Are you bushed?” Bruce laughs at the memory, then brings out the old guitar to play the tune he wrote about those early days, back before two signs and a speedbump were installed to remind campers to please stop at the gatehouse to check in, lest the caretaker get too lonely. You learn a lot about people when you hang out with them in their moments of leisure, he says, and lately there have been more and more people to meet. The campground is getting so busy these days, there’s talk of government dollars being put toward adding campsites and other expansions. It’s nearly 10 p.m. on a Sunday in June, and the sunlight is only just starting to dim. The mosquitoes along the Trout River are out in full force, feasting on the gray-haired, cherub-cheeked human ambling across the limestone banks. He frowns only slightly when a mosquito comes to a rest on his forehead, but doesn’t swat it away. He stops occasionally to bend down and pick up a loose stone, feeling the surface for the fossil traces of 400-million-year-old coral. He spots a shrub he’s never seen before, and picks off a couple leaves to peer at more closely. It’s Raymond Michaud’s nightly stroll, and tonight, the Sambaa Deh Territorial Park staff warden has company: a new arrival at the campground who’s asked for a guided tour. He knows every creek and waterfall, even the underground ones, better than his own home, he says. Well, except for that one whirlpool a camper recently reported discovering—Michaud will have to try and find that one, too. “I used to camp here before it became a camp,” he says, stopping to point out some wild onions. That was decades ago, in his self-described hippie days. (Sambaa Deh became an official campground in the late ‘70s). Taking care of the park and its visitors for the past three years, he says, has been his dream job. But he had to retire to get here. He resigned from his second term following a dispute with the local fire department. For years, he also worked in the Government of the Northwest Territories’ public works department. That meant hours and hours behind a desk every day, staring at screens. 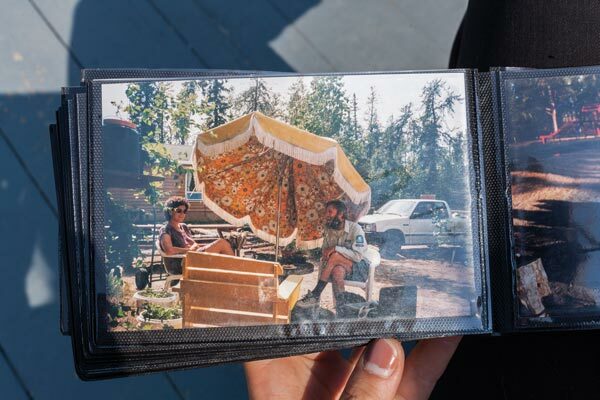 After retiring in 2011 at 58, Michaud and his wife Mavis got a caretaker contract at Blackstone Territorial Park near Fort Liard, then at Sambaa Deh. Since then, he’s lost 170 pounds. It may have saved his life. includes in his standard introduction, back at the park’s welcome centre. That’s when he pulls out a meticulously hand-drawn, hand-coloured map of the park, showing all the trails, the campsites, points of interest. Everyone who passes through gets a copy. Now, watching the falls, he recalls how, last summer, an adventurous couple successfully kayaked down them. It’s believed to be the first descent of the falls in modern history, maybe ever. Standing here, watching the waterfall in the subarctic dusk, his face is relaxed, serene, whereas an hour earlier, it had been all cheeks and smiles, welcoming new campers to his kingdom. But aside from him and his visitor, nobody’s around. Everyone’s settled in for the night. Looking up, he remembers the wildfires that destroyed the trees on the other side of the river two summers ago, and how, within weeks, he’d spotted fresh growth. That’s all new, he says proudly, pointing at the bright green layer poking out of the ashy woods, like a gardener showing off his healthy new tomato plants. After a few minutes watching the water, he turns around. It’s time to go. He’s got an early day tomorrow, driving five hours to Hay River for car parts, and he wants to have coffee and cookies ready for his campers before 8 a.m.